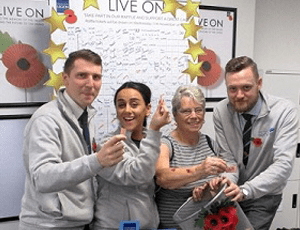 Staff at the Whitstable office of Fuel Card Services have raised £1,337 for the Royal British Legion’s 2015 Poppy Appeal. The project was led by Fuel Card Services account manager Scott Mooney, an army veteran who served in Iraq and Afghanistan. Scott and his colleagues asked local businesses to donate raffle prizes, then sold tickets and made collections outside their local Tesco. The grand prize was a luxury weekend break, with other prizes including a recording studio session, crystal goblets and a DAB radio. The raffle and collections took place alongside other fundraising efforts within the Fuel Card Services office. The company is recruiting account management staff, responsible for bringing in new customers and then looking after their business needs. No previous experience is necessary, with full NVQ training provided in sales and account management. Applicants will need to be excellent communicators with a confident telephone manner, self-motivated, energetic and positive. They can expect a competitive salary with uncapped performance bonus, life assurance, pension, discounts on private healthcare and more.